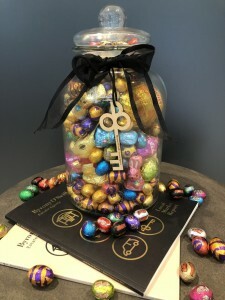 Like our Facebook page Byrony O’Neill Estate Agents OR follow our Instagram @byronyoneillestateagents and comment your answer to be in the draw to win our Easter chocolate jar. Entries close Wednesday 17th April 2019 at 4.00pm AEST. Participants must live in the Brisbane Metropolitan area. The winner will be the entry with the closest answer to the correct number of chocolates displayed in the jar. Only one winner will be selected. In the case of more than one correct entry, the winner will be selected by drawing a name at random from the correct entries. The result will be final and no correspondence will be entered in to. The winner will be determined on Thursday 18th April 2019 and announced on social media. The prize must either be collected from our office at 483 Milton Road, Auchenflower QLD 4066 or we can hand deliver to suburbs in Brisbane’s inner-west. Prizes will not be posted. The competition is open to residents of the Brisbane Metropolitan area, except employees of Byrony O’Neill Estate Agents and their close relatives and anyone otherwise connected with the organisation or judging of the competition.